Nothing says Thursday afternoon like a good fresh scone. For my American readers, a "scone" is sort of like a "biscuit", where a "biscuit" (as it is known to those of us who speak real english), is a "cookie". The scone can be sweet, served with jam and whipped cream, and eaten in conjunction with a good pot of tea and a newspaper (read, not eaten). A hot scone with melted butter and honey is also a perfect cure for rainy day melancholy, until one eats too many, in which case the melancholy takes on another nature. 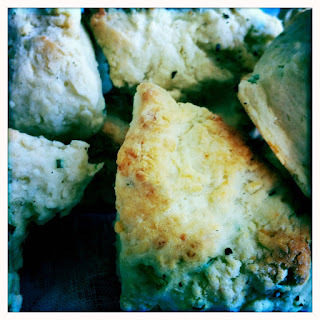 The scone can be savoury, though rarely in the manner of the American biscuit, which is just a salty scone. No. Savoury with pumpkin, or bacon, or, in the manner of Margaret Fulton, with cheese and chives. Preheat oven to 220C/450F (200C for fan-forced). Sift flour & salt into a bowl. Rub the butter through the flour until it resembles breadcrumbs. Make a well in the centre and pour in the milk. Cut mixture with a knife, adding a bit more milk if necessary. Turn out mixture onto a floured bench, and bring together lightly with your hands. Pat, or roll, mixture to 3/4-1″ thickness. Cut out into rounds, or squares, and place on a tray, lightly greased & floured, or lined with baking paper. Smear a bit of butter onto each scone. Bake for 10-15 minutes, until tops are brown. 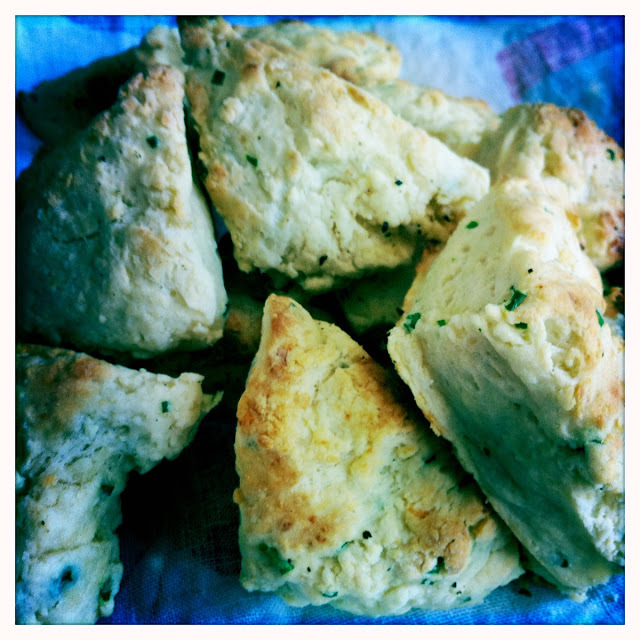 Use a KitchenAid and you will get fluffy, most delicious scones with a crunchy lovely crust. 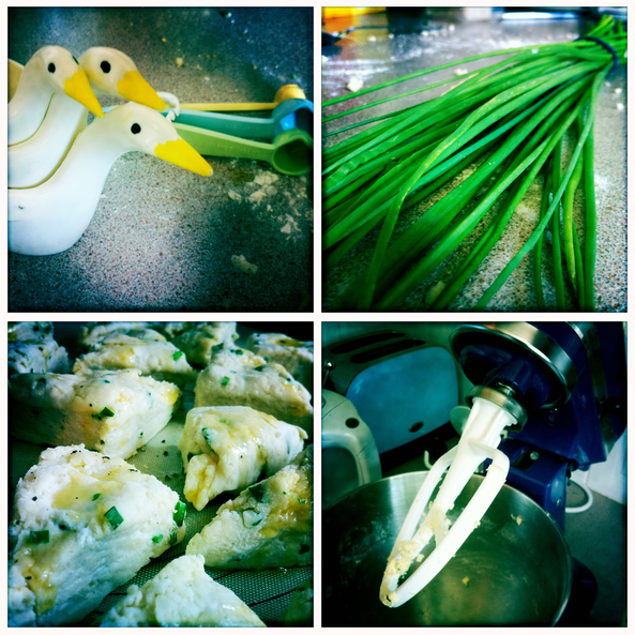 Use the whisk attachment on medium speed to crumb the butter and flour, then add the cheese & chives. Mix on low speed to combine. Pour the milk from the side and watch as the work is done for you. It does take a little while to come together, but be careful not to over mix. I had to add a little milk, and do a bit of hand forming, but unlike my usual scone efforts, I ended up with no dough under my fingernails. Most pleasing. They are a dish best served warm and buttery.